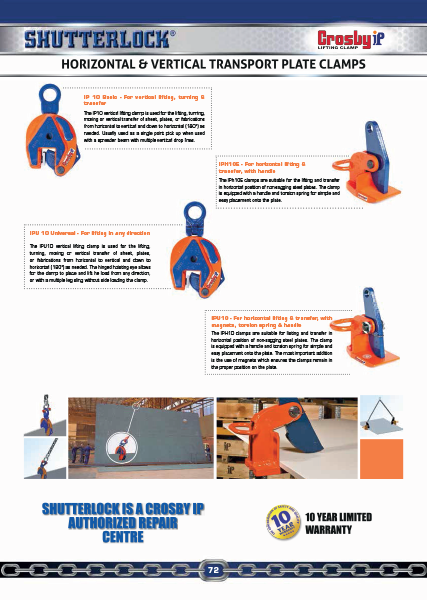 Shutterlock offers quality Crosby IP Clamps the are suitable for various applications. Available in capacities of .75 thru 25 metric tons. Wide variety of jaw openings available: 0 to 120mm. Equipped with handle for easy placement. 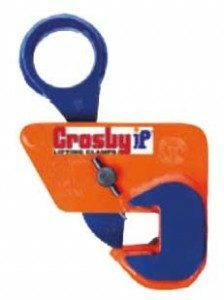 Company name Crosby (IP), logo, Maximum & Minimum Working Load Limit and jaw opening permanently stamped on body. Manufactured by a ISO 9001 facility. 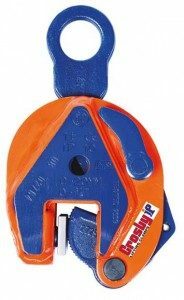 IPU10 – Standard clamp for materials with a surface hardness to 37Rc (345HB). IPU10S – For use on stainless steel material. IPU10H – For use with materials with a surface hardness to 47Rc (450HB). 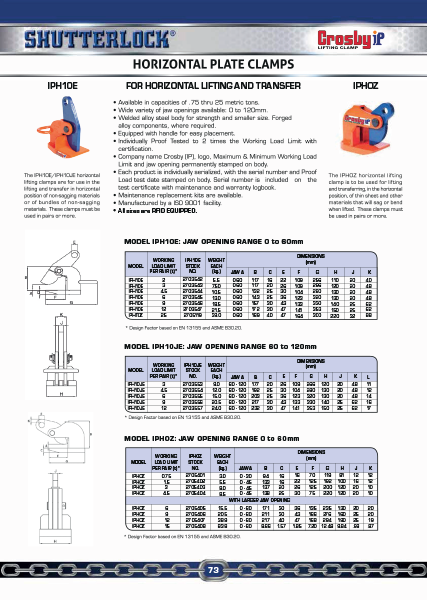 Full 180o turning range for material transfer, turning or moving. 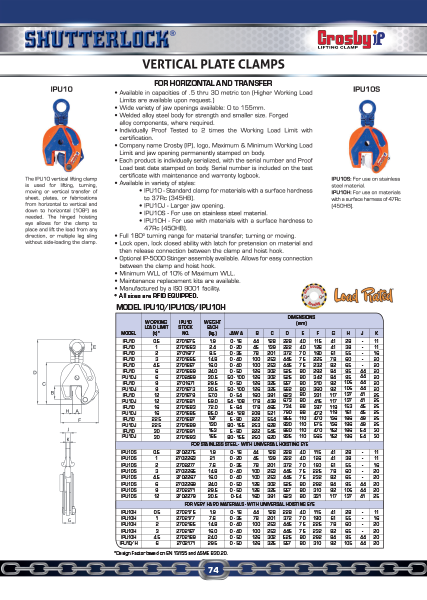 Lock open, lock closed ability with latch for pretension on material and then release connection between the clamp and hoist hook. For use in almost all sectors of industry where during the lift or transfer, no damage to the material is permitted. Available in capacities of .5, 1 and 2 metric tons. Wide variety of jaw openings available: 0 to 38mm. Optional IP-5000 Stinger assembly available (see page 420). 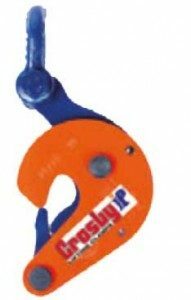 Allows for easy connection between the clamp and hoist hook. Material must be clean and dry. 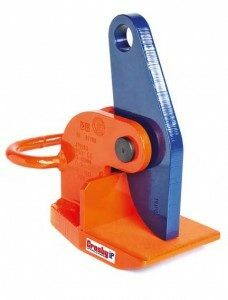 The IPBHZ beam clamp is used for horizontal lifting and transfer of steel beams. The base is slotted to allow the clamps to be used from end of beams as well as from the flange. 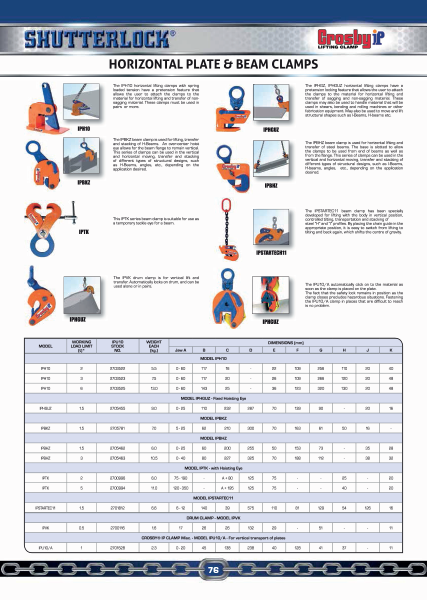 This series of clamps can be used in the vertical and horizontal moving, transfer and stacking of different types of structural designs, such as I-Beams, H-beams, angles, etc., depending on the application desired. The IPBKZ beam clamp is used for lifting, transfer and stacking of H-Beams. 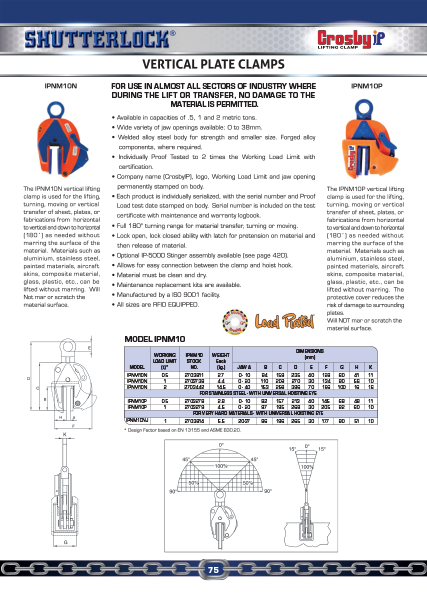 An over-center hoist eye allows for the beam flange to remain vertical. 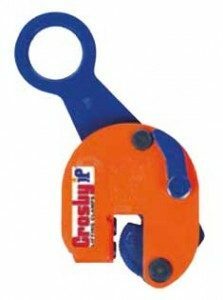 This series of clamps can be used in the vertical and horizontal moving, transfer and stacking of different types of structural designs, such as H-Beams, angles, etc., depending on the application desired. The IPVK drum clamp is for vertical lift and transfer. Automatically locks on drum, and can be used alone or in pairs. The IPU10/A automatically click on to the material as soon as the clamp is placed on the plate. 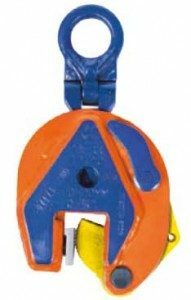 The fact that the safety lock remains in position as the clamp closes precludes hazardous situations. 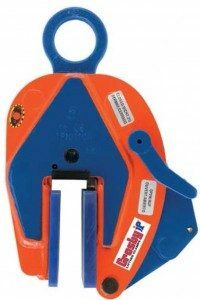 Fastening the IPU10/A clamp in places that are difficult to reach is no problem.